Every year Stampin’ Up! brings in 5 new “In-Colours” in the June catalogue and retires 5 colours. When colours retire, it means they are no longer available for purchase. This also includes all related products like card stock, inks, ink refills and matching accessories. These are the colours that are retiring this spring. These colours are around for TWO years so we get quite attached to them over the two years. 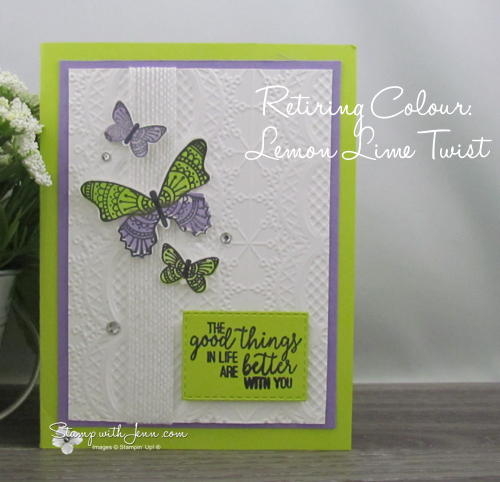 Since June 2017 many of use have become especially attached to colours like Lemon Lime Twist on this card. The Lemon Lime Twist colour goes so well with many other colours as it is bright and vivid and makes a colour scheme fresh and vibrant. 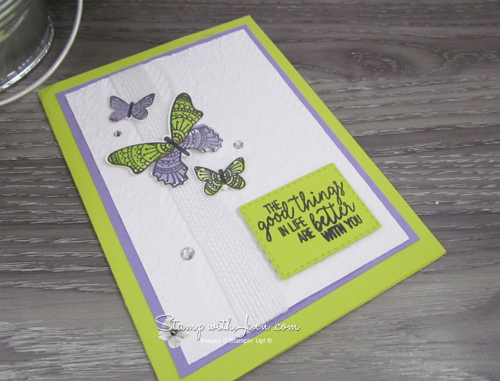 On this Butterfly Gala card Lemon Lime Twist is paired with the new Highland Heather colour. The “In Colors” are no longer available as of May 31st, but in reality these colours, especially popular colours like Lemon Lime Twist sell out much sooner. If Lemon Lime Twist is a colour you love or a colour you have already purchased, you might want to stock up on the matching products now before they are sold out. See all of the products available in the 2017-2019 Retiring Colours here. The full supply list for this card is below. To shop for any of these items click on any of the products images below to go to my Online Store. 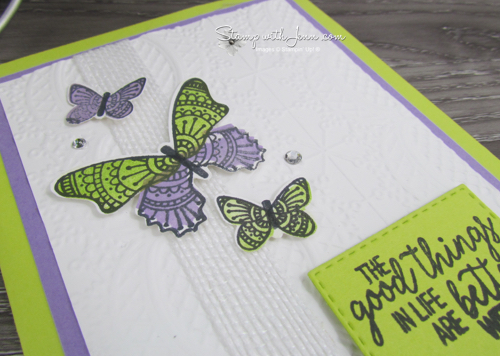 You can see another card made with the Butterfly Gala stamp set here. Don’t forget to take advantage of the Sale-a-bration promotion and stock up on your 2017-2019 ‘In Colors’ now!